Golf is played with golf clubs of various types. There are four major categories of clubs, known as woods, hybrids, irons, and putters. 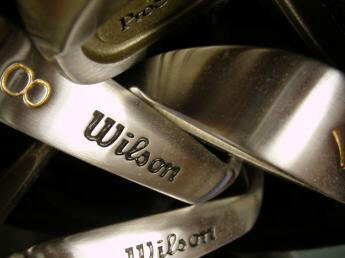 Wedges resemble irons and may also be counted among these. A golfer is allowed to carry up to fourteen clubs during a round. Woods can be played without a tee off the ground far more easily than the driver and are used for long approach shots. They have large heads that are somewhat spherical in shape with a slightly bulging clubface and a flattened bottom that slides over the ground without digging in during the stroke. Originally the “wood” heads were made of wood but modern club heads are usually made of hollow steel or titanium, sometimes filled with foam. The shaft enters the wood off-center, in such a way that the face of the wood is roughly at a right angle to one side of the shaft. Woods are used for the longest shots, ranging from 200 to 300 yards (180-275 m). The typical loft for wood faces ranges from 6 to 26 degrees (a 3-wood has about 15 degrees of loft, a 5-wood 20-21 degrees). The 1 wood is usually referred to as a driver. Many club manufacturers are also producing 7-woods, 9-woods and even 11-woods which are excellent out of rough. Irons are used for shorter shots than woods, especially including shots approaching the greens. Irons typically range from 36 to 40 inches (90-100 cm) in length. Iron heads are typically solid with a flat clubface. The typical lofts for irons range from 16 to 60 degrees. “Long” and intermediate irons (i.e. those with a lower loft) are usually played from fairway or other easy ground. “Short” irons (with a higher loft) are played from difficult ground and especially for approach shots to the green. A full set of irons traditionally comprises a 3-iron, 4-iron, 5-iron, 6-iron, 7-iron, 8-iron, and 9-iron. 1-irons and 2-irons are usually sold separately as few handicap golfers use them, because the little loft they have makes it difficult to get the ball airborne. Wedges are irons with a loft of more than approximately 50 degrees. Pitching wedges are rather similar to other irons. Sand wedges have specially designed undersides that make them suitable for shots from bunkers or from the rough. Lob Wedges have a very high loft and are used for approach shots or from sand. A Pitching wedge typically has a loft of 45 to 48 degrees, a Sand wedge a loft of 54 to 58 degrees and a Lob wedge a loft of 58 to 62 degrees. Some companies also offer Approach (or gap) wedges (AW) and High (or super) Lob Wedges (64 degrees or more). An approach wedge fills the gap between the pitching and sand wedge. Gap wedges typically range from 50 to 54 degrees. Putters come in a variety of head shapes and have a very low loft and often a short shaft. They are used to play the ball on the green, but may occasionally be useful for playing from bunkers or for some approach shots. Hybrids: are a cross between a fairway wood and a long iron, combining the best characteristics of each and mainly designed for distance control and accuracy. A hybrid club has a larger head and more mass than an iron, but with a head still much more compact than that of a typical wood. They tend to have shorter shafts than woods for the same loft, making them easier to control and more accurate (like an iron). The flat face and higher launch angle produces more spin in the ball allowing it to stop faster and with more accuracy. They also have no face bulge or roundness like fairway woods which keeps the shots simple. The bottoms often have runners or rails that help the club interact positively with the turf whether it is long rough, short fairway or sand. All other things being equal, with a hybrid club one should be able to get the ball higher and farther than with an iron with the same loft, while reducing the effects of mishits. For beginners, a hybrid set, where the long irons (3- and 4-irons) are replaced with utility clubs designed, may be a perfect choice. More about choosing the right clubs in the books on the right and in the following article: Choosing the right golf equipment. For more detailed information about loft, trajectory and spin, shaft flex and shaft torque and the construction of golf clubs, see our article about Golf clubs. 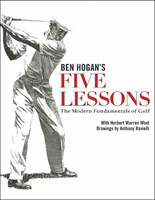 For product info see our favorite Club sets, Drivers, Putters, Irons, Hybrid clubs, Woods, Wedges, Left-handed clubs.